Neutral palette of medium brown and grey tones. Quietly rugged, our Mussel Shell River Ledge Stone veneer adds warmth and organic beauty to new builds and renovation projects. A small amount of this textured material goes a long way when sprucing up any style architecture home – from rustic to mid-century Modern or contemporary. Featuring a neutral palette of medium brown and grey tones, this natural ledge stone veneer works with many different colors and styles. This material also works equally well inside or outside. With a traditional ledge stone shape, the profile is roughly rectangular, with clean edges, top and bottom. It's available in 2" to 8" face heights and 3" to 18" lengths, and also with matching 90 degree cut corners, for a tidy finish. 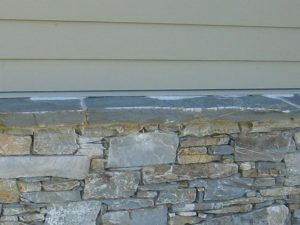 Consider using Mussel Shell River Ledge Stone on half walls or around eaves on front elevations, or around picture windows and other architectural features. It can be applied around the front door, and on adjacent columns that support a porch or covered portico to create a welcoming and grand entrance way. Define planting beds by applying the material across low retaining walls and to other landscaping elements as part of an overall design scheme. Mussel Shell River Ledge Stone also looks great used for patios and other outdoor living and entertaining spaces, around grills and fire pits. It can also be integrated into pool design for siding, exterior water feature walls and gateway posts. Inside the home, the stone can be used in a classic way by applying it to fireplace surrounds, creating a striking and luxurious impression to the space. Designer tip: extend the stone right to the ceiling, either following the lines of the chimney, or extending it corner to corner to create a striking feature wall. This product would also work well in a front foyer or main stairway to add a sense of grandeur for arriving guests. No matter where around the home you use natural stone veneer products such as Mussel Shell River Ledge Stone, the satisfying results are increased visual interest and textural warmth.